I’ve expressed my love for all things Magic School Bus previously. My almost six-year-old daughter and I are having a great time working our way through our library’s collection of Magic School Bus chapter books. The two we read most recently were great finds for kids interested in animal welfare. In Butterfly Battle, the students and their teacher Ms. Frizzle go on a field trip to a butterfly exhibit at the local botanical garden. As would be expected, the kids get turned into butterflies. They have a harrowing adventure flying through the city, dodging birds while trying to find something to eat in the concrete jungle. When they are very hungry they come across a garden, but realize just in time that it was treated by pesticides. They continue on, exhausted and weak, until they finally come across a wildflower sanctuary and finally can eat. 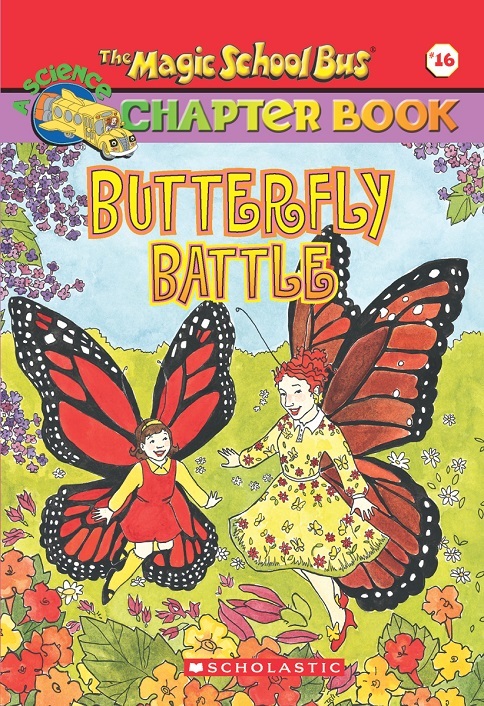 There is a section at the end of the book explaining the importance of planting butterfly gardens in our own backyards and gave some how-to information doing so. Of course, this is exactly what my daughter wanted to do. Being the dutiful animal-loving parents that we are, we went to the local nursery and spent way too much money on butterfly-friendly plants for our backyard. I recommend this book to all animal-loving kids with the caveat that it may end with you spending a lot of money and having to plant a garden. I am happy to report that we have seen butterflies visiting our butterfly garden already this spring. 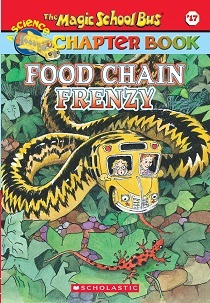 In Food Chain Frenzy, on the way to a local museum to learn about the food chain, Ms. Frizzle decides the best way to learn about the food chain is to experience it yourself. The Magic School Bus transforms into a ladybug, a snake, a fish, a krill, all the while learning about how animals get energy either by eating plants or by eating animals that eat plants. There are a lot of great asides in this book that would appeal to vegetarian families. I really appreciated that when talking about humans, it said that humans are omnivores though some humans choose to be vegetarians and get their energy solely from plans. In other contexts, when my daughter hears humans described as omnivores, she’ll always say, “Some humans are herbivores.” It was nice for this book to include that here. There are some great student report throughout the text that address the damaging effects of the human diet, such as a report on overfishing and how damaging it is to other ecosystems. My favorite student report is about how humans control their own food chains by farming animals themselves and how devastating this is on the environment. This was a great book that continued to surprise me throughout. I would highly recommend this book to any vegetarian child.